YSC Surveys are based in Cardiff and provide comprehensive surveys of yachts and motor boats for the marine community and insurance companies. YSC Surveys Ltd ’s principle yacht surveyor is Simon Allan who carries out marine surveys to yachts and motor vessels in South Wales and South West England. Based in Penarth the areas covered for boat surveys include: Bristol, Portishead, Burnham-on-Sea, Newport, Cardiff, Penarth, Barry, Porthcawl, Swansea, Tenby, Milford Haven and Neyland. So whether you are buying your first boat and want to know its condition or need a survey for your insurance policy, just call us and we will be happy to discuss your requirements. 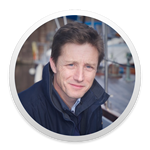 Simon is a marine surveyor based in Penarth, Cardiff, providing surveys on yachts and small craft for both first time buyers and experienced sailors. Although based in South Wales, Simon’s work can take him all over the country and abroad. After a successful career in design engineering and production management, Simon refocused his career on marine vessels and surveying. This led to working in the marina and boatyard industry whilst studying Yacht and Small Craft surveying through the IIMS. A keen sailor, Simon has a Laurent Giles ketch and a 1964 Aquacraft skiboat both wooden and restored by himself. Survey request dealt with promptly at the agreed price and resulted a in very comprehensive report, backed up with a picture library and explanations, plus recommendations for repairs and possible additions. First rate, professional and highly recommended. Simon's helpful guidance in discussion before the survey, the immediate post survey phone call with a synopsis of the result and subsequent speedy issue of the final report made the buying decision easy with the confidence of Simon's undoubted knowledge and experience. Followed by the offer to refer back to Simon means that the survey fee was a real investment for the future ownership of my new boat. Make sure we have the correct vessel details and location. Ensure the boatyard and broker or owner know when we are coming and we have access to both the yard and the vessel. The vessel must be safe and accessible. We may not be able to go aboard if the vessel is unsafe or access to the site is unsafe. These can only be surveyed to head height if they are stepped. If they are un-stepped please make sure they can be easily found and identified in the boatyard. Have all service records, warranty documents and invoices to confirm major repairs and renewal of major equipment available. Invoices for Standing Rigging and for Sail Drive Gaskets and Stern Drive Bearings and Bellows are very important. Try to locate the Invoices rather than Quotations. Please have equipment manuals available. The broker’s inventory would also be of great assistance. The vessel will need to be lifted out of the water and safely chocked on the hard. This needs to be arranged by the Client with the boatyard and broker or owner. Have the hull pressure washed to remove fouling growth. Please do not reapply antifouling until after the survey as we may need to remove small areas of antifouling to get moisture readings and to check condition of the gelcoat. To get meaningful meter readings the vessel should ideally have been out the water for four or five days, depending upon the temperature and humidity. 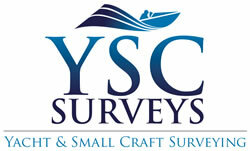 YSC Surveys are qualified, insured and experienced Marine and Yacht surveyors conveniently located for the following areas: South & West Wales, Milford Haven, Neyland, Dale, Swansea, Burry Port, Barry, Cardiff, Cardiff Bay, Penarth, Barrry, Porthcawl, Newport, Bristol Channel, Portishead, Weston-Super-Mare, Burnham-on-Sea, Watchet, Ilfracombe, Somerset, Devon and South West England. Not sure how old my rigging is? Most insurance companies have policies that only cover the service life of items. Some of these are determined by the manufacturers guidelines and or by the insurers experience of claims. The same is true for standing rigging, even if it looks fine, there may be crevice corrosion unseen in the fittings and therefore most insurance companies deem the service life of standing rigging as 10 years or less if the vessel has been raced. Age of Saildrive and stern leg seals? Most insurance companies only cover claims within the service life of items. The service life can be determined by the manufacturers guidelines or by the insurers policy. Most manufacturers specify the service life of seals and bellows for Saildrive units and stern leg however they do vary. For example Yanmar and Volvo are between 5 and 7 years whilst Bukh say they should be inspected and not replaced unless damaged or aged. Check with your insurance company and try to keep receipts of seal changes. Nice as it is go over a boat with the owner or purchaser, it does distract the surveyor from a logical inspection process that can lead to a less than complete survey. Ideally, the surveyor is best left to get on with the job so that you get the most accurate and complete report possible. A the end of the survey the surveyor will call you to discuss his initial findings but you should wait for the written report which is his considered opinion on which you should base any decisions. Thee are standard rates for the different surveys available. These are competitive and reasonable so please call to discuss your vessel and the type of survey you require. There is no VAT charged or hidden costs. Travel costs are charged at 35p/mile if over 25 miles plus any marina contractor charges or bridge tolls. The written report will be emailed to you normally within three days of the survey. You should wait making a decision on purchases until you have the written report, as that is the surveyors considered opinion. A comprehensive survey commissioned by a potential buyer prior to making the purchase. This will generally be done with the boat out of the water so we can fully access the external surfaces of the hull before going on to assess the rest of the boat’s structure and systems. A pre-purchase and condition survey is considered to ascertain the structural condition of the craft. All other items are inspected on a non-intrusive, visual basis only unless specifically agreed in the contract of the survey. A survey commissioned by the vessel owner when his insurance company request a survey before renewing an existing policy. These used to be required when the vessel was 20 years old and then every 5 years although this is changing on some insurance policies now. This survey is commissioned by an insurance company when a vessel they insure has suffered damage or loss. The objective is to determine the extent of the damage and likely repair costs for the insurer. There may be times when a boat owner or buyer does not need the surveyor to carry out a full survey. This is called a limited scope survey and although it may be less expensive, it is very important for the client to understand the limitations of the inspection. This may not be adequate to support an application for insurance and additional survey work may be required at extra cost. However, limited scope surveys have their uses, for example: if the boat has been repaired and the owner wants to check on the quality of the repair work or, an owner would like to have the hull & bulkheads surveyed on an regular basis to monitor condition and moisture readings. We also provide a ‘walk through’ survey which provides an overall view of the general condition of the vessel without going into great detail. It is often used by clients who are looking to purchase a particular vessel but do not have the time to travel to view a number of craft. YSC Surveys can do this for you, viewing a number of craft and then providing a report detailing comparisons between them. If you require repair work or modifications carried out to your boat, we can take the aggravation out of finding suitable engineers and yards by arranging, organizing and managing the works for you. This can be from overseeing simple repairs to major works involving multiple contractors. Project managing work can be difficult, especially if you are too busy or too far away to attend the vessel on a regular basis to ensure it is completed to your satisfaction. YSC Surveys are fully qualified and have many years experience of this kind of work and can make the task that much easier.